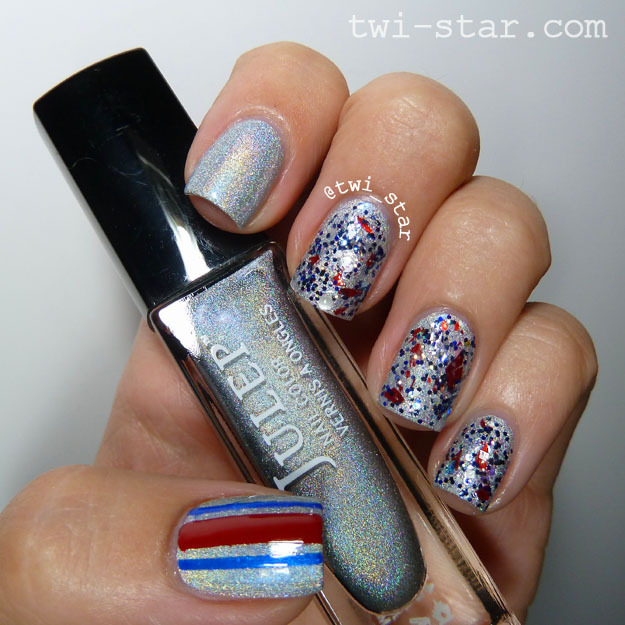 For my base I used Julep Tin Man from their Wizard of Oz set, a subtle holo silver. I really love this one! It had a nice even formula, was easy to apply and isn’t in yo face holo but you can definitely see rainbow throwing going on. 2 coats of Tin Man. I found Tin Man to show more holo on than in the bottle, bonus. Holo polishes aren’t my fav things in the world but I really dig this one since it isn’t so crazy. On the middle, ring, and pinky I used 2 layers of Gridlock Lacquer The Rockpile over Tin Man. Due to the larger pieces of glitter I did have to move them around a bit with the brush but sometimes I get particular about glitter so that may just be me lol I love that this glitter can double as a Bills polish and a USA/4th of July glitter, a 2fer some might say. A macro of The Rockpile, look at all that goodness jammed in there. For the thumb striping I used Christian Louboutin Rouge. A very decadent red stripe if I do say so myself! I have worn this polish alone and I did take pics but like a dope I forgot to clean up near the cuticles and the pics aren’t my best sooooooo I plan on using it again real soon so that I can post a review. PS I love it and it’s awesome. 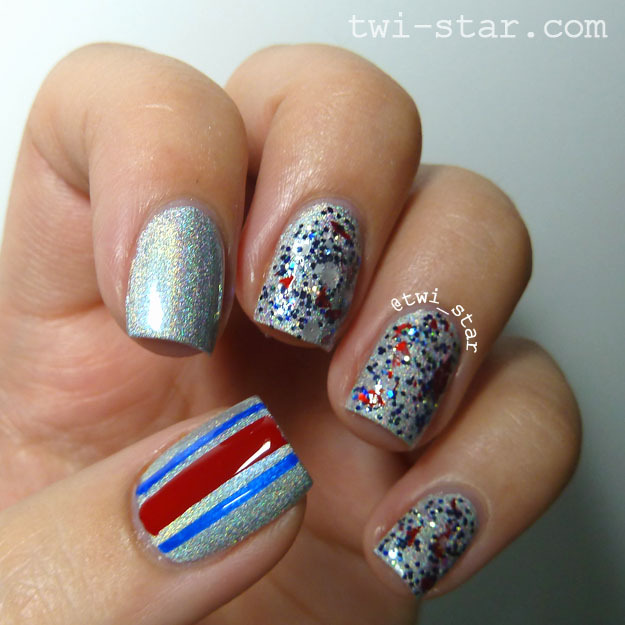 Speaking of accent nails………..I used striping tape on the thumb to mimic the stripes on the Bills uniforms. The red is Christian Louboutin Rouge and the blue is Julep Ally, Ally is a super glowy royal blue and is a real eye catcher. I call this pic: Polish Things still life No. 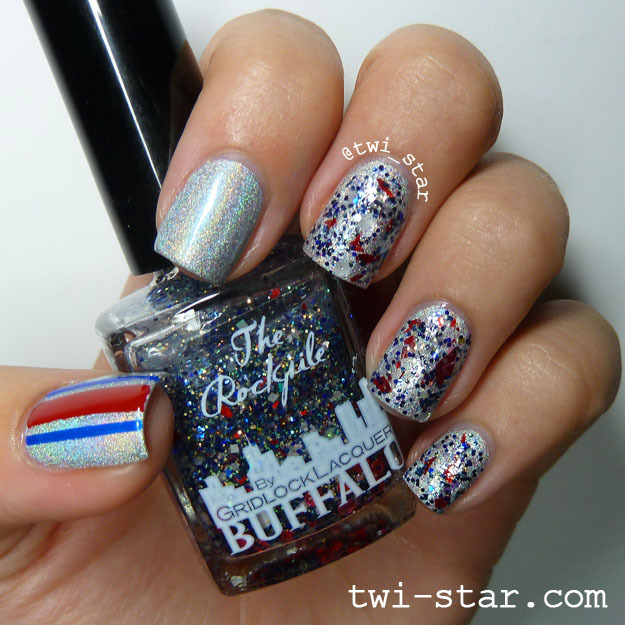 12 (If you are a Bills fan you will get my choice in number ;) ) For my base coat I used Bliss Kiss Simply Smooth and Glisten & Glow HK Girl top coat. Are you a football fan? I’d rather be painting my nails. Julep Holly and Taryn - teal with jewels!